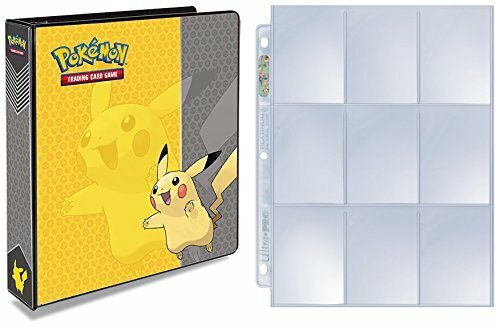 Home › Toys › Pokemon Pikachu 3-Ring Binder With 25 Platinum Ultra-Pro 9-Pocket Pages - Alb..
Pokemon Pikachu 3-Ring Binder With 25 Platinum Ultra-Pro 9-Pocket Pages - Alb.. It features everyone's favorite electrifying Pokemon, Pikachu! This binder comes with 25 Platinum-series, Ultra-PRO brand 9-pocket pages. It is refillable/expandable, and can accommodate approximately 200 single-loaded pages for total Pokemon card storage of approximately 1800 cards. Made by Ultra-PRO, a leader in safe card and collectible storage, this stylish3-ring binder fits all standard-sized 3-hole pages and inserts, from tradingcard pages to school supplies. Includes 25 9-pocket pages to get you started,with expandable capacity up to approximately 200 pages.